The phenomenon produced by the TM-Sidhi Programme of Yogic Flying gives the experience of bliss, and generates coherence between consciousness and matter in the body. EEG studies have shown that during this phenomenon, when the body lifts up in the air, physiology and consciousness are completely integrated. This integration takes place at the level of the Unified Field of Natural Law—the single underlying field of intelligence, or consciousness, which lies at the basis of all diversity in the physical world, as the ocean is the basis of all its diverse waves. The Unified Field has the character of infinite correlation. An impulse of coherence from this level instantly reconstructs and transforms unnatural, stressful, negative, undesirable tendencies in the brain physiology, and brain functioning becomes coherent. Considering this phenomenon in the light of the Unified Field Theories of modern Physics and Quantum Cosmology, we understand that at the scale of Super Unification all aspects of Natural Law at every point in the universe become infinitely correlated with each other. A delicate impulse at any one point in space and time can create a precipitous change throughout the entire universe. This long-range correlation explains how action on the level of the Unified Field (the transcendental field of consciousness), at the scale of Super Unification, can have a profound influence that can spread anywhere and everywhere throughout the universe. Inspired by the success of the TM-Sidhi Programme in reducing negativity and hostilities in different regions of the world, in 1979 Maharishi held the first annual World Peace Assembly to purify world consciousness. Assemblies were held year after year on the international, national, and regional levels with many thousands of Yogic Flyers coming together to raise world consciousness through the group practice of Maharishi's Transcendental Meditation and TM-Sidhi Programme. However, Maharishi explained that just as water only boils at 100 degrees centigrade, only with the square root of one per cent of the world's population, approximately 7,000, practising the Transcendental Meditation and TM-Sidhi Programme together in one place, would coherence be produced in world consciousness, leading to world peace. Therefore, in December 1983, Maharishi assembled for the first time more than 7,000 Yogic Flyers from all over the world to create global coherence in world consciousness and thereby give the world a 'Sample Taste of Utopia'. This experiment, conducted at Maharishi International University (now Maharishi University of Management) in Fairfield, Iowa, USA, from 17 December 1983 to 6 January 1984, was the first experiment to create world peace through the Global Maharishi Effect. 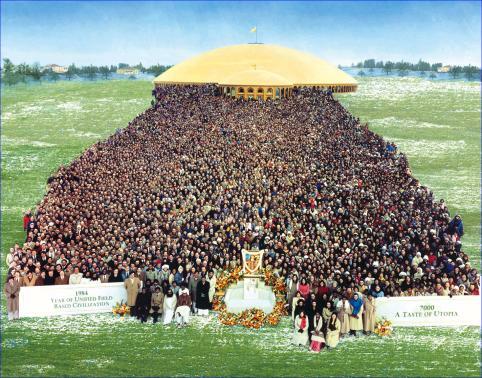 7,000 experts in Maharishi's Transcendental Meditation and TM-Sidhi Programme in the presence of His Holiness Maharishi Mahesh Yogi, creating a 'Taste of Utopia' for all mankind, Maharishi International University, Fairfield, Iowa, USA, 17 December 1983 to 6 January 1984. Scientific Research found that during the three weeks of this assembly there was a marked decrease in hostilities and violence worldwide and increased positivity in the international fields of politics and economics. This was the assembly which clearly demonstrated the possibility of creating world peace through the practice of Maharishi's TM-Sidhi Technique of Yogic Flying. Later, similar assemblies were held in The Hague, Holland, and Washington, DC, which confirmed the findings of the assembly. Time-series analysis showed that during these assemblies, when the number of experts in the Transcendental Meditation and TM-Sidhi Programme approached or surpassed 7,000, there were significant global reductions in international conflicts. Statistics provided by the Rand Corporation showed that casualties and fatalities due to international terrorism decreased an average of 72 per cent during the assemblies. These studies used the most advanced and rigorous research designs and statistical methodologies to precisely evaluate the effect of large coherence-creating groups on standard sociological measures of the quality of life in cities, provinces, nations, and the world. The power of peace-creating groups to decrease warfare and terrorism has been tested repeatedly. The results produced by temporary peace-creating groups (lasting weeks or months) have been consistently positive—with nearly immediate reductions in war deaths averaging better than 70%. Wave of global peace: One large peace-creating assembly (8,000 experts) that continued for several years (1988-90), created a history-transforming wave of peace around the world. Major conflicts in the world came to an end—including the Soviet invasion of Afghanistan, a seven-year war between Iran and Iraq that had killed millions, and, most notably and unexpectedly, the Soviet-American Cold War that had threatened the world with nuclear annihilation for forty years. Scientific acceptance: Most of these studies have been carefully scrutinized by independent scholars, then accepted for publication in mainstream academic journals. The findings are based on open public data, with strong correlations between peace-creating attendance and reduced social violence, lead-lag analysis supporting a causal interpretation, and alternate possible explanations ruled out. The success of these assemblies confirmed the importance of continuing the momentum of creating coherence and positivity in all parts of the world, by creating permanent groups—on the local, national, and global level—who would not only prevent global war, but in time would eliminate all conflicts on earth and create world peace through the regular practice of Yogic Flying together in one place. On the local level, Maharishi is ensuring achievement of permanent world peace through the creation of Peace Palaces, built according to the ancient principles of Vedic Architecture, for the world's largest 3,000 cities, which will be home to a group of 100 to 200 peace-creating experts. Also, Maharishi's Global Super Radiance Programme invites all who have learnt the Transcendental Meditation and TM-Sidhi Programme to practice their programme in groups, morning and evening, to create an indominatable influence of coherence in their area. On the national and also global level, courses and programmes continue to be offered with the opportunity to create the Maharishi Effect through extended practice of Maharishi's Transcendental Meditation and TM-Sidhi Programme. Most notable of these are the Maharishi Purusha Programme and the Mother Divine Programme, permanent coherence-creating groups founded by Maharishi to create an indomitable nourishing influence of coherence in world consciousness. The centerpiece of Maharishi's plan to create a perpetual Global Maharishi Effect is the creation of a permanent group of 40,000 (growing to 200,000) peace-creating experts on the banks of the Ganges River in India. Such a group will be five times larger than any peace-creating group yet gathered anywhere in the world. Since repeated research shows that the peace-creating effect increases as the square of the number of Yogic Flyers involved, this group will exceed all previous groups in peace-creating power by 25 times.